My original plan for a headline was “Boks Goggles”...a pun on the popular TV show that makes direct reference to yet another match which has at its centre a controversial decision by the match officials. In the end I chose to play safe, opting for something that I feel reflects the tour for Irish rugby as a whole. But as much as I tire of harping on refereeing, I certainly cannot let this writeup go by without pointing out that yet again I feel that Ireland have been hard done by. I don’t think there’s a conspiracy against us, nor do I think there’s one towards the Springboks in any way other than they were the “home” side...but the fact remains that whatever cliché you choose to trot out, be it “Luck of the Irish” or “rub of the green” or anything similar, we most certainly weren’t getting it. Right...let’s examine the Le Roux incident, though we shouldn’t without first looking at the ten minutes that led up to it. After just three minutes Conor Murray put one up from his own 22 after which Luke Marshall was pinged for offside. Technically he was, though he was absolutely nowhere near the ball when it landed. Jantjies nailed the penalty to give the home side an early lead. Shortly after that, the Boks put up a kick of their own, which JP Pietersen was extremely near when it landed...near enough to catch as it happened. However, he too was offside and nobody seemed to notice. Then we had the Willie Le Roux challenge. There’s many pointing out that the Springbok full back has his eyes on the ball. That is true...up to a point. The question we should be asking is...did he make a genuine attempt to catch the ball? By the time the ball arrives to a catchable height, I think you can tell by the photo what the answer is. Le Roux shuts his eyes and sticks out a hand. How that’s an attempted catch is beyond me. O’Halloran, meanwhile, was showing all his boyhood GAA skills in taking it cleanly. So no - Le Roux’s actions were not those of someone who believed they could contest...they were those of someone trying to thwart. Which brings us, as usual, to the notion of intent. Of course he didn’t mean to hurt O’Halloran. But once you close your eyes, or turn your back as Stander did, you have to take responsibility for what comes next. So there was no doubt that this deserved the sanction of a card. But what colour? Here’s where the TMO comes in. The whole “where does he land first” issue is never straightforward. Gravity simply doesn’t choose a single part of your body to make sure you can distinguish which finds the turf before any of the others. If anything it was a dead heat between his neck, his shoulders and the top of his back. And thus, it should be red. And another thing...if you fully believe the top of back/shoulder theory, why do you allow the concussion test for O’Halloran? Surely you must think this is purely for show? Naturally we can’t expect the officials to take into account what happened to CJ Stander two weeks earlier. Still, by my reckoning, while the situations and collisions were different, the amount of recklessness was about the same so they’re either both yellow or both red yet in each case the home side got the advantage. We actually made pretty good hay out of the extra man, which makes you wonder what we would have done with it for the remainder of the match. But we’ll never know, and I’ve said my piece on the incident now, so let’s crack on with the remaining rugby shall we. Our only try of the day was actually Schmidtball at its finest. Lineout on the 22, power play, crash ball teasing out weak points along the defensive line, and eventually it was Luke Marshall going over with a nice finish. Shortly after we were at it again, only this time all we got was a penalty...Jackson missed this as Le Roux returned to the field but we soon got another chance and it was 3-10. There was definitely a feeling of deja vu in that we looked like we could be on our way to amassing another big lead. Trouble is though, for the 70 minutes of the contest where it was 15 v 15, we didn’t find it so easy breaching their first row of tacklers at all. Now credit where it’s due...the Springbok defence was in the zone for this contest. An extremely tough nut to crack indeed. But by the same token you have to say they had to be, because we had shown in the previous weeks that any weak spot would be exploited. Our problems with the ball were partly down to pressure from their D but it was also down to accuracy, mostly in midfield. I may incur the wrath of Ulster fans when I say the Jackson/Olding/Marshall axis was costly but I don’t mean it as an insult to a particular province. We simply never had the benefit of the same starting combo over the three weeks and this is a vital area especially to a Joe Schmidt plan. Layoffs were going astray, knockons were killing set moves...our accuracy just wasn’t there when it needed to be. The stats tell the story...we had two-thirds of the possession yet they had two-thirds of the territory. We struggled to do anything with it when we had it. Another area where we had costly issues was the scrum. I’m done analysing this area of the game. Having played prop myself I should be all over this like a rash but what is done on the pitches today is a far cry from anything I saw “in my day”. Predicting when a pen is coming, and indeed which way it’s going, has become a lottery much of the time. Let’s just say that on penalty count from the scrum in this match, we were getting mulchified. But the score was still 10-6 in our favour with just two minutes left in the first half, and we had a lineout throw on halfway. “All” we had to do was bring the score into the dressing room and we’d be well set. We won the set piece (good day at the office here) but fell to the midfield mixups once again and the home side’s determination got them into our 22 before Jantjies floated a perfectly-weighted kick over Andrew Trimble into the grateful arms of Pietersen (he was well onside this time, don’t worry I checked!) for a killer score before the break. So that left us with just 40 minutes left in our season (remember..for the Boks, this was akin to a late-November international). Plenty of time for us to claw our way back. 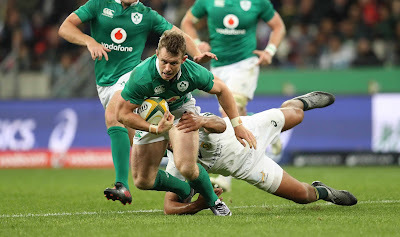 But pretty much everything that ailed us in the first half followed us into the second - though this time they were coming in sequence...Ireland possession > knock on > scrum penalty > 3 Bok points. And I hate to say it but the inconsistent refereeing continued as well. Many thanks to the great Three Red Kings blog for saving me some spadework here...at one stage CJ Stander is penalised for not releasing when he wasn’t even the tackler while Faf de Klerk gets no sanction for not releasing when he actually was the tackler. When the final whistle blew I saw a lot of comment online suggesting Joe Schmidt didn’t use his bench properly. This complaint annoyed me greatly. Not that it wasn’t necessarily justified, but for that to be the first source of grievance after this display, indeed this series, was mind-boggling. First and foremost I have to compliment our defence, and for this credit goes both to Andy Farrell and Les Kiss for leaving things in decent shape. Apart from that lung-busting mile-high final quarter in Johannesburg, we made life very difficult for the home side right up to the very end. When we had our accuracy, we did very well with the ball. Sadly it seemed to desert us in that final test when we needed it most. Few could argue we left at least a few points out there on the pitch even without the officiating controversy. Then you have to look at the injury count. Back at the beginning of August when we played our first test of the new campaign I firmly believed we could win the World Cup. (Note could, not would). But that belief was based on at the very least three from O’Connell, Sexton, O’Brien, O’Mahony, Payne, Rob Kearney & Bowe being availavle for the duration. Throw in Henshaw and they were all absent in Port Elizabeth. So when we’re doing our post mortem on this series, I’ll let those who want to pick out only negatives do just that. I’m not saying there weren’t any, but we’ve got our southern hemisphere win, the ranking point boost that goes with it, and a lot of extra game time for players in key positions. Joe now knows for sure that he can move Payne to 15 and still get a solid outing from his starting centres, for example. And I have to hand it to Allister Coetzee & his new Springbok charges for clawing their way back from that first test defeat and deficits in the other two. They learned a lot of things too...like what a pacy 9 they have in de Klerk and what Ruan Combrinck brings to the party (I’d still put him in the centre though). But for us, the season ends as one of overall disappointment, that has to be said. The tour, however, must be seen as a net positive for Ireland. Be honest...if the bookies’ points spreads came true and we lost the three tests but 15, 13 and 8 points respectively, would you have been surprised? Instead we lost on aggregate by just SIX. We can dwell on what might have been or we can look forward to what comes ahead. And with a promising crop of Wolfpuppies coming through the ranks and all four provinces getting top-table Euro rugby next season, I know what I’ll be doing, that’s for sure. As for Joe Schmidt, I know he has some difficult decisions to make over the next while, and hopefully he’ll get all the space he needs. Obviously, I’m hoping he’ll stay, but by the same token I appreciate the many factors involved in him exploring other options. Which brings us to the end of another season. We’ll definitely be doing some harping over the next month or so though nowhere near as frequently. I’d like to thank all our sponsors throughout the year for helping to keep the lights on here at Harpin Manor, in particular our mainstay the Irish Rugby Supporters Club. Then we have our contributors - Ciaran Duffy, Joe Sheppard, Emma McGarry, Kristian Ross, Neil Keegan among others...also, thanks to those who pass on little nuggets of links and info they find interesting.